Attributes measure the abilities of a character. Unlike traits, they are numerical rather than binary. Each character has base attributes which are then impacted by their traits. The total is displayed on the character screen, while the base is visible on mouseover. Base attributes are mostly acquired during childhood through education, but can also be altered by events. Some events and event chains will only have certain choices open to the player if the qualifying level of an attribute is active. For example, if a vassal demands a title, but their liege rejects it, there will normally result in a lengthy opinion malus; although, if the liege's diplomacy is high enough, they can reject the request politely and avoid upsetting the vassal. For many applications of attributes, the relevant factor is the state attribute, instead of the character's attribute. 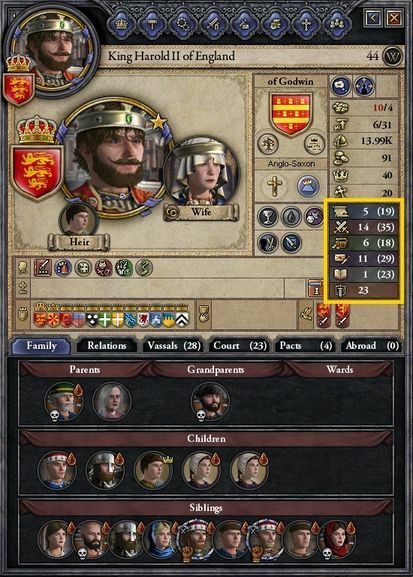 If Conclave DLC is active, the player can increase state attributes by swapping a regent-councilor to the Advisor council slot. The state attributes are displayed between parenthesis on the character screen. Diplomacy skill reflects ability to negotiate and please people. It is the determining attribute for a chancellor's success while doing council jobs. Used to determine direct vassal limits, along with spouse's diplomacy (vassal bonus= 30% of ruler's diplomacy + 30% of spouse's diplomacy). If the character is a chancellor on their liege's council, this attribute is used to determine their ability. Martial skill is an indicator of skill at warfare and combat, and is the determining attribute for a marshal's success while doing council jobs. If the character is a marshal on their liege's council, it is used to determine their ability. increases the rate at which armies recover morale. Stewardship improves management of demesne and is the determining attribute for a steward's success while doing council jobs. If the character is a steward on their liege's council, it is used to determine their ability. Increases demesne income (+2% per point). Intrigue is a measure of skill at manipulation and scheming. It is the determining attribute for a spymaster's success while doing council jobs. It does not give any technology boost. Increases imprisonment chance (and makes the character harder to get imprisoned). Learning is a measure of a character's knowledge. It is the determining attribute for a Court Chaplain's council jobs. If the The Reaper's Due Expansion is active, the court physician's successes are also affected by this attribute. If the character is a Court Chaplain on their liege's council, it is used to determine their ability. Gives the character piety (or equivalent) (+0.02/month per point). Breeding: A child grown up by high skilled progenitors (or guardian) has a better chance of ending up with higher base attributes (with Conclave Expansion). Many artifacts provide attribute bonuses. Two hidden attributes measure the character's physical well-being: health and fertility. A character's base health and fertility are not normally visible, but trait effects are listed in tooltips. The "charinfo" console command uncovers these attributes in the tooltip for all characters. The player may also adjust those attributes at game start by using the Ruler Designer. Healthy characters are less likely to fall prey to, and more likely to fully recover from, disease. They are also less likely to die from old age per month than ill characters. High health is key to a long life. Fertility determines how likely an individual character is to conceive children. it should be noted that both parents' fertility is taken into account. In addition, it appears that having spouses who are also lovers will make it 3 times more likely for pregnancy to occur. Most diseases decrease fertility (and symptoms, if The Reaper's Due DLC is active). For example, Measles (-10%), Leper (-95%), Vomiting (-30%). A character who is either a Horse or a Cat has a drastically lowered fertility score (-5000%). This page was last edited on 26 February 2019, at 11:59.